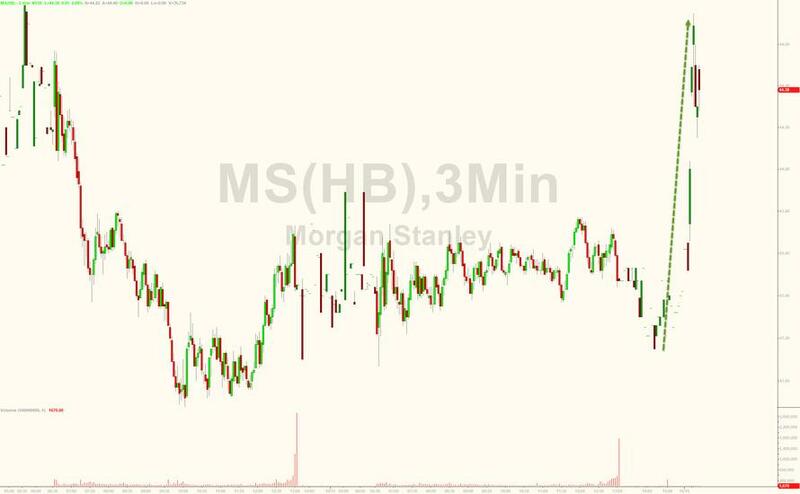 Morgan Stanley stock is 2% higher premarket after reporting another stellar quarter with beats across the board, especially in trading and investment banking, with its biggest competitor Goldman set to report in a few minutes. The bank reported Q3 EPS of $1.17, handily beating estimates of $1.01, on revenue of $9.872BN, also above the $9.5BN expected, and compared to $9.2BN a year ago. Net income climbed to $2.1BN, up from $1.8BN a year ago. Benefiting the bottom line was Morgan Stanley's effective tax of 24.4% in the third quarter, compared to 28.1% a year earlier, if higher than the 20.6% in Q2. And while the top line beat virtually all estimates, it dipped back under the $10BN level for the first time in 4 quarters. Commenting on the result, CEO James Gorman said, "In the first half of the year, we produced strong results across the franchise. Despite the seasonal summer slowdown in the third quarter, we reported solid revenue and earnings growth demonstrating the stability of the franchise.Year to date, we have produced an ROE of 13% and ROTCE of 15%. We remain well positioned and optimistic for the remainder of the year." A Bloomberg commentator noted that it was interesting that Gorman didn't make any reference to his views on the economy in his quote in the statement, whereas each of the other big bank executives made a point to tout the economy's current strength. In fact, on Friday JPMorgan CEO Dimon went a step further and flagged risks he thinks could derail the current strength. Equity sales and trading of $2.02BN also beat estimates of $1.98BN, and also higher from the $1.9BN a year ago. Equity underwriting revenues of $441 million increased from $273 million a year ago primarily driven by higher revenues on IPOs and convertible offerings. While MS beat across all product lines, the beat on investment banking revenues hides that Morgan Stanley's M&A revenues fell 8% in the third quarter, an even steeper drop than JPMorgan, which saw advisory revenues fall 6%, but better than Bank of America, whose M&A fees fell 30%. Citigroup's M&A revenues were up 9%. On the positive side, this was the third consecutive quarter where the bank reported higher results from commodities compared with a year ago; this suggests that banks have finally recovered after an abysmal 2017 resulted in one of the worst years for commodities trading across financial firms and trading houses. In the bank's key product line, wealth management, net revenue rose to $4.4BN vs $4.2BN a year ago. Pretax net income was $1.19BN vs $1.1BN a year ago, resulting in a pretax margin of 27.1%, on $471 billion in AUM. Within wealth management, Morgan Stanley's 15,655 representatives produced average annualized revenue per representative of $1.1 million in the current quarter. 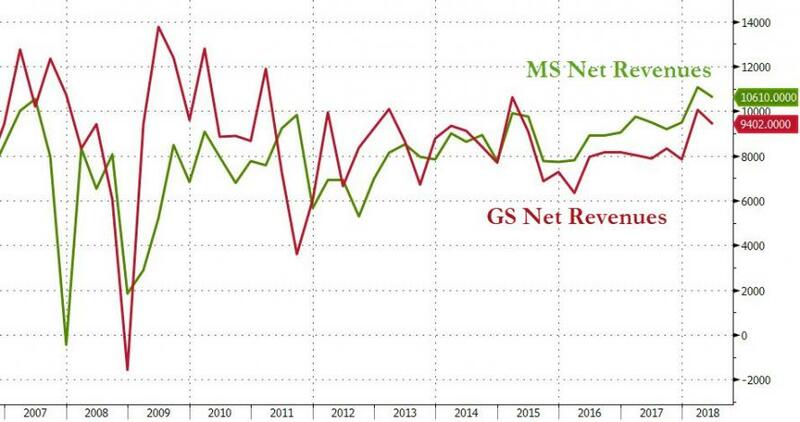 One highlight, per Bloomberg, is that transactional revenues in wealth management were down about 5.5% to $698 million "driven by lower fixed income revenues" with some asking what is spurring lower activity there. Finally, during the quarter ended Sept 30, 2018, the Firm repurchased approximately $1.2 billion of its common stock or approximately 24 million shares. As a result of the strong earnings, the bank's stock spiked 2% higher in kneejerk reaction, also pushing the stock of Goldman higher, which is set to report momentarily.